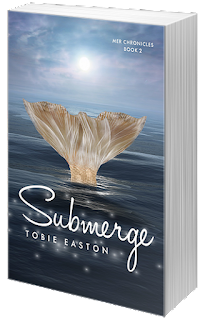 Welcome today's stop on the Submerge (Mer Chronicles #2) by Tobie Easton Blog Tour presented by Month9Books and hosted by Chapter by Chapter. Today's stop is a review as well as a chance to enter the great giveaway that is being run throughout this tour. 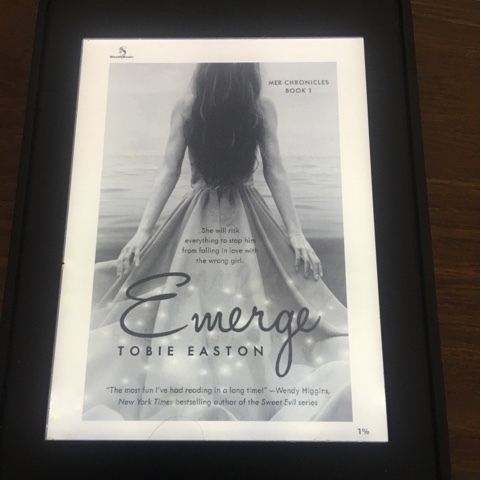 I really enjoyed book 1 in this series, Emerge. So I was really looking forward to reading book 2 and even after a year since i read the first one, I was able to sink right back into the story. The story takes place a few months after the end of book 1, the Little mermaid's curse is broken, Lia and Clay have spent much of their summer together, whilst Lia's parents have been below securing support for their bid for the crown now that the wars are over. It's time for the trial of Melusine and her father. I liked that even though the curse was broken and the mermaids had their immortality back, everything was not automatically perfect and we got to see the characters re-adjusting to the changes. Lia was still dealing with repercussions of her choices in book 1 and full or worry that her sirening would come out and condemn her to jail and ruin her parents chances for the crown. Where a lot of book one was set in the human world, most of book two takes place in the mermaid world so we got to find out a lot more about the mermaids life both above and below the water and this helped make the story come more alive. The story flowed well and moved at a good pace and i found myself engaged from beginning to end, finishing the book in a just a couple of hours. Whilst this is still predominantly about Lia and Clay, I liked that we got to see more depth and find out more about peripheral characters like Caspian and Lia's sisters in particular. Overall this book is a great blend of action, danger,romance and intrigue and I thoroughly enjoyed the read. Given where the story ended, I am guessing there is more to come in regards to Lia and Clay's story and I cannot wait. Lia Nautilus may be a Mermaid but she’s never lived in the ocean. War has ravaged the seven seas ever since the infamous Little Mermaid unleashed a curse that stripped Mer of their immortality. Lia has grown up in a secret community of land-dwelling Mer hidden among Malibu’s seaside mansions. Her biggest problems are surviving P.E. and keeping her feelings for Clay Ericson in check. Sure, he’s gorgeous in that cocky, leather jacket sort of way and makes her feel like there’s a school of fish swimming in her stomach, but getting involved with a human could put Lia's entire community at risk. So it’s for the best that he’s dating that new girl, right? That is, until Lia finds out she isn't the only one at school keeping a potentially deadly secret. And this new girl? Her eyes are dead set on Clay, who doesn't realize the danger he's in. If Lia hopes to save him, she’ll have to get closer to Clay. Lia’s parents would totally flip if they found out she was falling for a human boy, but the more time she spends with him, the harder it is for her to deny her feelings. After making a horrible mistake, Lia will risk everything to stop Clay from falling in love with the wrong girl. Nikk the Sapphired Book Dragon has read 12 books toward her goal of 300 books. Share book reviews and ratings with Nikk the Sapphired Book Dragon, and even join a book club on Goodreads.